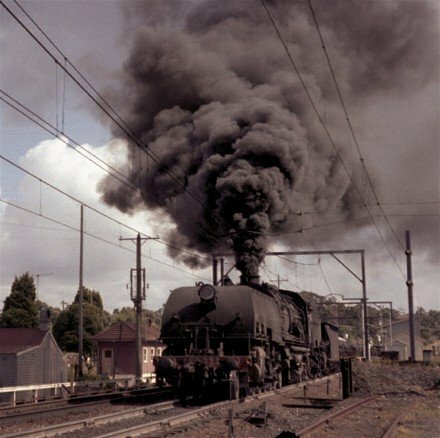 The picture below is of “6040”, the last steam locomotive to be built for the Department of Railways New South Wales in Australia. She was in service as a coal/goods transporter from 1957 through 1967 before the increase in the use of diesel on the railways lead to the death of steam. She was eventually rescued and displayed by the New South Wales Railway Museum, which is where the photo was taken. There, starting from her 50th birthday, a team of volunteers have been restoring her. But that’s perhaps not the thing that’s most-unusual about her, or her class (AD60). I’ve highlighted on the photo a feature that you’ve probably never seen before, even if you’re of an inclination to go “Ooh, a steam loco: I’mma have a closer look at that!”. What you’re seeing is an open pipe (with a funnel-like protrusion at one end) connecting the area behind the leading wheels to the cab. What’s it for? Have a think about it as you read the rest of this post, and see if you can come up with the answer before I tell you the answer. AD60 “6012”, seen in this 1950s photo, had not yet been fitted with the “mystery pipes”, which were added later. These pipes weren’t initially fitted to “6040” nor to any of her 41 sisters: they were added later, once the need for them became apparent. 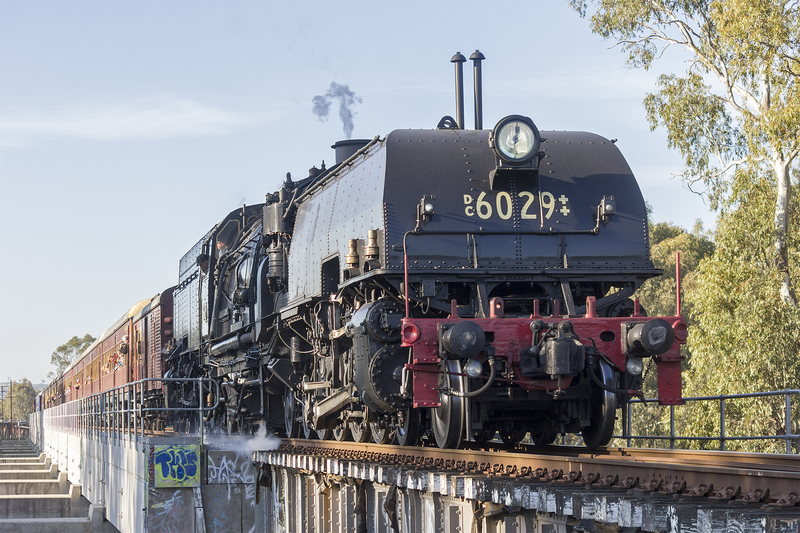 “City of Canberra”/”6029”, restored to functionality (seen here in 2015), either never had or wasn’t refitted during restoration with the mystery pipes. It’s worth taking a moment though to consider why this is such a long locomotive, though: you may have noticed that it exhibits a rather unusual shape! The AD60 is a Garratt locomotive, an uncommon articulated design which places a single (usually relatively-large) boiler straddled in-between two steam engines. Articulating a locomotive allows a longer design to safely take corners that were only rated for shorter vehicles (which can be important if your network rolled out narrow-gauge everywhere to begin with, or if you put too many curves onto a mountain railway). Garratt (and other articulated steam) locos are a fascinating concept however you look at them, but I’m going to try harder than usual to stay on-topic today. Just go around the mountain! 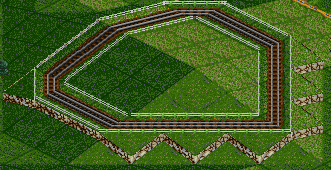 (Around and around and around…) Oh damn, I’ve gone off topic and now I’m thinking about OpenTTD. And by the time you’re articulating a locomotive anyway, engineer Herbert William Garratt reasoned, you might as well give it a huge boiler and two engines and give it the kind of power output you’d normally expect from double-heading your train. And it pretty-much worked, too! Garratt-type articulated steam locomotives proved very popular in Africa, where some of the most-powerful ones constructed remained in service until 1980, mountainous parts of Asia, and – to a lesser extent – in Australia. Each of the forward and rear engine bogies in a Garratt design pivots independently; the boiler and cab are suspended between them. Indeed: it’s the combination of length of this loco and its two (loud) engines that necessitated the addition of the “mystery pipe”. Can you work out what it is, yet? One final clue before I give the game away – it’s a safety feature. While you think about that, I direct your attention to this photo of the Я-class (of which only one was ever built), which shows you what happens then the Soviet Union thought “Da, we have to be having one of these ‘Garratt’ steam engines with the bending… but we have also to be making it much bigger than those capitalist dogs would.” What a monster! 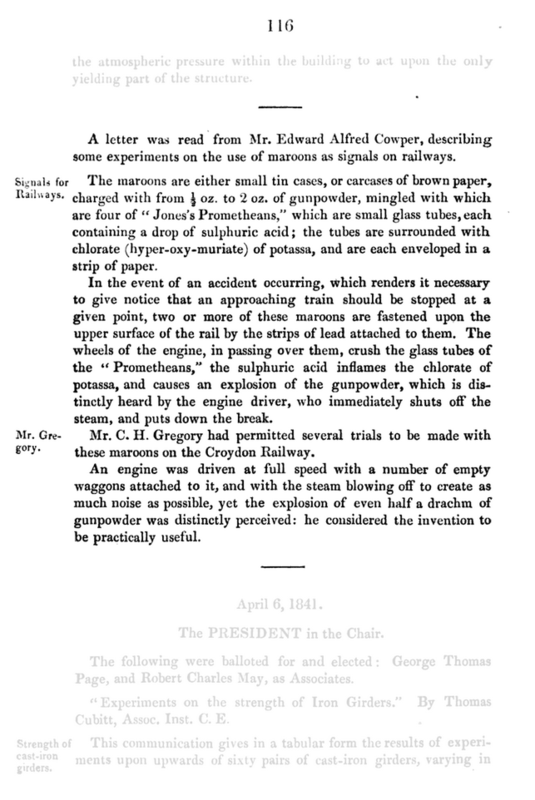 Minutes of the meeting at which Cowper demonstrated his invention (click through for full text via Google Books). In the 1840s, engineer Edward Alfred Cowper (who’d later go on to design the famous single-arch roof of Birmingham New Street station which lasted until its redevelopment in the 1960s) invented a device called the railway detonator. A detonator is a small explosive charge that can be attached to a railway line and which will explode when a train drives over it. The original idea – and still one in which they’re used to this day – is that if a train breaks down or otherwise has to come to a halt in foggy conditions, they can be placed on the track behind. 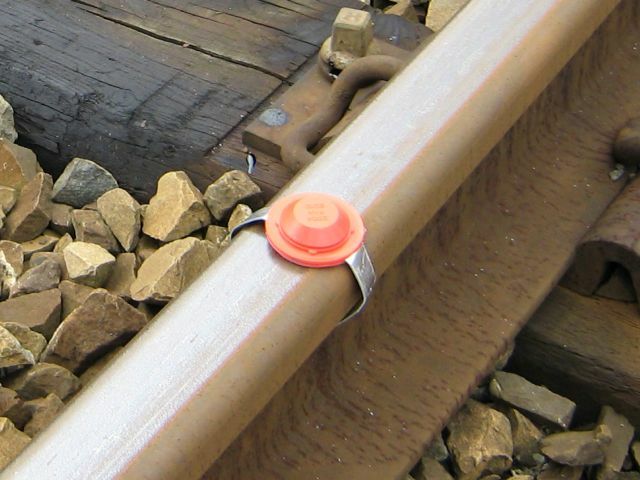 If another train comes along, the driver will hear the distinctive “bangs” of the detonators which will warn them to put on the brakes and stop, and so avoid a collision with the stopped train ahead. They’re the grown-up equivalent of those things kids used to be able to buy that went bang when you threw them on the ground (or, in a great example of why kids shouldn’t be allowed to buy them, at least in the case of a childhood friend of mine, detonated them by biting them!). But when your cab is behind not only the (long) boiler and (even longer and very loud) articulated engine of an AD60, there’s a very real risk that you won’t hear a detonator, triggered by the front wheels of your loco. Your 264-tonnes of locomotive plus the weight of the entire train behind you can sail on through a trio of detonators and not even hear the warning (though you’re probably likely to hear the bang that comes later, when you catch up with the obstruction ahead). The mystery tubes on the AD60 were added to address this problem: they’re a noise-carrier! Connecting the area right behind the leading wheels to the drivers’ cab via a long tube makes the driver more-able to hear what’s happening on the rails, specifically so that they can hear if the engine begins to roll over a detonator. That’s a crazy bit of engineering, right? Installing a tube along most of the length of a locomotive just to carry the sound of the wheels (and anything they collide with) to the driver’s cab seems like a bizarre step, but having already-constructed the vehicle in a way that introduced that potential safety problem, it was the simplest and lowest-cost retrofitting. In other news: this is what happens when I finish the last exam I anticipate sitting in a long while, this week (I know I’ve said that before, last time I was in the position of finishing a final-exam-before-a-dissertation). Clearly my brain chooses to celebrate not having to learn what I was studying for a bit by taking a break to learn something completely different. Earlier this year I found a mystery cable. But today, I’ve got an even bigger mystery. What the hell is this? I found it in a meeting room at work, tucked away in a corner. Aside from the power cord, there are no obvious interfaces to it. There are two keyhole-shaped “buttons” which can be pressed down about 2cm and which spring back up (except when they jam, but I think they’re not supposed to). My best bet is that it’s some kind of induction-based charger? I imagine some kind of device like a radio microphone or walkie-talkie that can be pushed-in to these holes and the button “spring” is just about closing the hole when it’s not in use. But the box is old, based on the style of plug, cable, and general griminess of the hardware… not to mention that it’s got a stack of PAT test stickers going back at least 11 years. 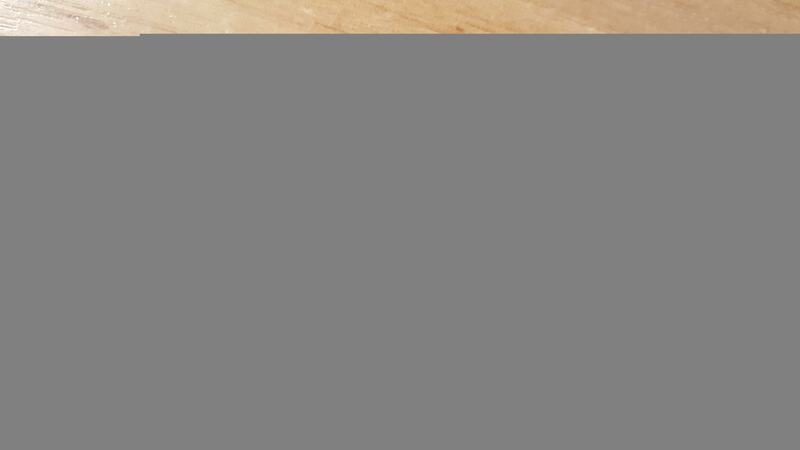 No real markings anywhere on it: there’s a small hole in the (metal) base and PAT test stickers. I’ve plugged it in and tried “pressing” the buttons but it doesn’t appear to do anything, which supports my “induction charger” hypothesis. But what does it charge? I must know! Edit: The only Electrak I can find make lighting control systems. Could it be something to do with lighting control? I can’t find anything that looks like this on their website, though. Edit 2: Ah-hah! Looks like it’s some weird kind of electrical socket. You put the key-shaped plug in and “twist”. 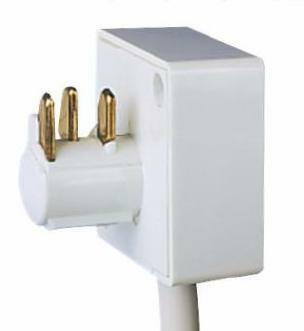 The plugs apparently look something like this, although I can’t find any here. 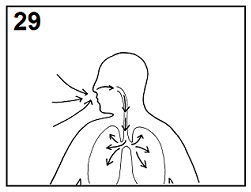 Edit 3: Hang on a minute… the most-recent PAT test sticker indicates that it was tested in… November 2019. Now my working hypothesis is that this is some kind of power supply system for a time machine we haven’t yet built. I’ve asked a number of colleagues what it’s for (i.e. what plugs into it) and nobody seems to have a clue. While rooting through our attic, Ruth‘s brother Owen just found a mystery cable. It almost certainly belongs to me (virtually all of the cables in the house, especially the unusual ones, do), but this one is a mystery to me. End #1 of the cable is a 13-pin male serial connection with 6 connected pins, spring-loaded. It seems to be designed to screw in at one end. The screw is worn. The more I look at it, the more I feel like I’m slowly going mad, as if the cable is some kind of beast from the Lovecraftian Cable Dimension which mortal minds were not meant to comprehend. It’s got three “ends” and is clearly some kind of signal combining (or separating) cable, but it doesn’t look like anything I’ve ever seen before (and don’t forget, I probably own it). On the other side of the split, end #2 of the cable terminates in a fine metal mesh (perhaps concealing a microphone, small speaker, or temperature/humidity sensor). It has a “push-to-talk” style clicker switch and a “tie clip” on it. Every time I look at it I have a new idea of what it could be. Some kind of digital dictophone or radio mic connector? Part of a telephone headset? Weather monitoring hardware? A set of converters between two strange and unusual pieces of hardware? But no matter what I come up with, something doesn’t add up? Why only 6 pins? Why the strange screw-in connector? Why the clicker switch? Why the tie clips? Why “split” the output (let alone have cables of different lengths)? Can you help? 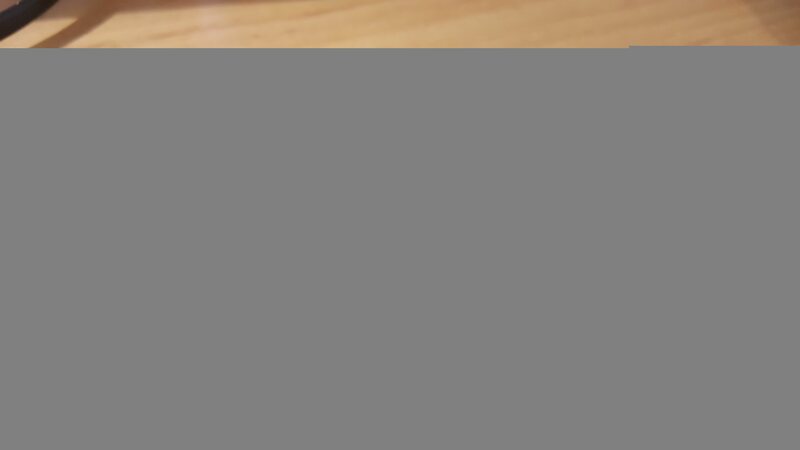 Can you identify this mystery cable? Prize for the correct answer! What is it? What is it for? I’ve never seen anything like it before! The first is the short-lived webcomic Crimson Herring. Personally, I’m hoping that it’ll come back to life, because it really had lots of potential. In each episode, a “crime drama” plays out, and you – the reader – are left with just enough clues to solve the case. Sometimes you have to really pay attention to the pictures, other times to the words, and it’s really got a good idea going for it. A frame from Crimson Herring – Duel at Dawn. Even if it turns out to be completely dead, now, you can go back and read the archives: start here! 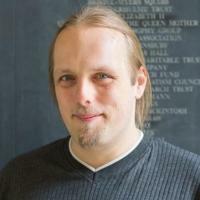 And if you like it, leave a comment and let the author know; see if we can get it brought back again. A recent Abstruse Goose, called “A Simple Puzzle 4”, had me thinking for a few days, and then the answer suddenly came to me. Frame 29 from Abstruse Goose – A Simple Puzzle 4. The idea behind the comic is really quite clever; but once you’ve worked out the key, putting the panels into the right order isn’t difficult at all. Give it a go! This blog post is about Marmite. I apologise if it makes you hungry, nauseous, or confused. My partner enjoys Marmite. This isn’t a surprise: I’ve known it for years. Some weekend mornings I’ve seen her enthusiastically scoff down some Marmite on toast, and I’ve known times that she’s been feeling run-down and hungry and the prospect of a bit of Marmite is exactly what she needs to get her motor running again. She doesn’t eat it all the time, but she likes to keep a jar around in anticipation: Marmite lasts pretty much forever, so there’s no hurry. It’s only since living with her, though, that I’ve seen so much of the strange sticky substance as I have. That’s not her doing, I’ll stress: she’s always respectful of the fact that I seem to just be one of those people who’s just never going to be a Marmite-eater, and she doesn’t surprise me with Marmite-infused foodstuffs. In exchange, I try not to complain whenever I can smell that the jar is open. Her husband enjoys Marmite too. Sometimes she makes Marmite whirls, pastry spirals with a sharp taste of Marmite, and I think she does so mostly because she knows that he enjoys them so much. I honestly don’t know how often he eats the stuff other than when she serves it: occasionally, I guess. 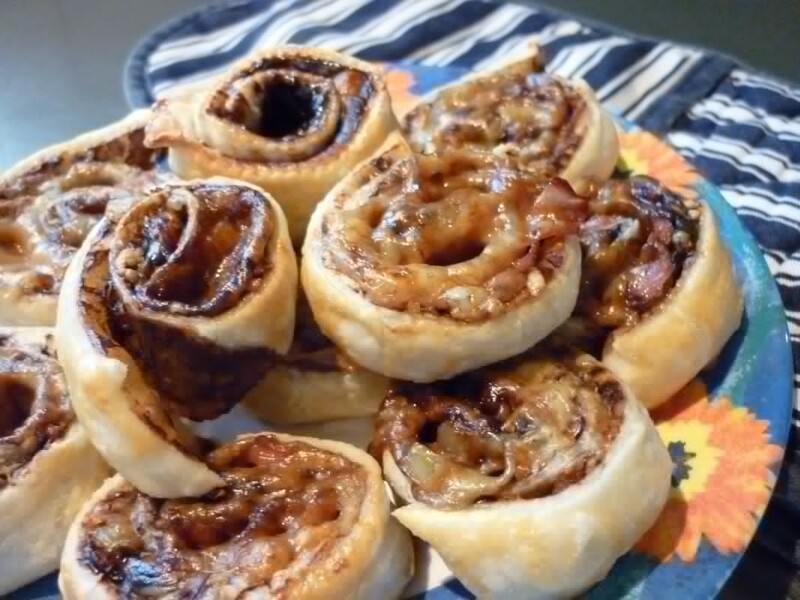 Marmite whirls. You love them, or you hate them, or you go round and round and round them like an escaped rollercoaster. But now there’s Marmite in my cupboard. I’m not sure why I keep it there. 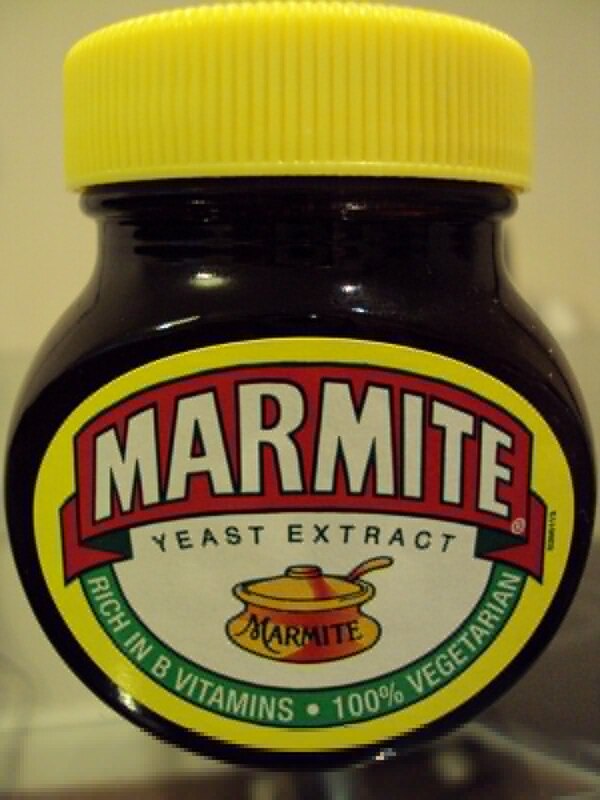 I still don’t really like Marmite, although I think that with experience I’ve learned to appreciate what others see in its flavour, even if it doesn’t sit comfortably in me. I look at the jar of Marmite in my cupboard. “Why are you there?” I ask it, “What am I supposed to do with you?” It doesn’t answer. It is, of course, only Marmite. I realise that I’m standing alone in the kitchen, talking to my shelf, and I feel a little stupid. But it’s a puzzle that I can’t solve: how did the Marmite even get into my cupboard? I certainly didn’t buy it. Did it… put itself there? Time for some buttered toast. This blog post is not about Marmite. My apology still stands. The week before last, I received an unusual package at work. It contained a single-serving packet of organic hot chocolate, which I later consumed (and it was delicious). There is, however, a mystery: from whom did this care package originate. 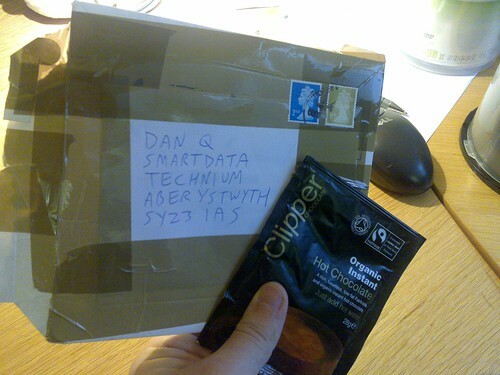 The postmark is unclear, so I’m not sure which post office handled it, but it’s hard to imagine somebody who lived in Aberystwyth spending 69p to have this delivered to me when they could have just dropped it in themselves. 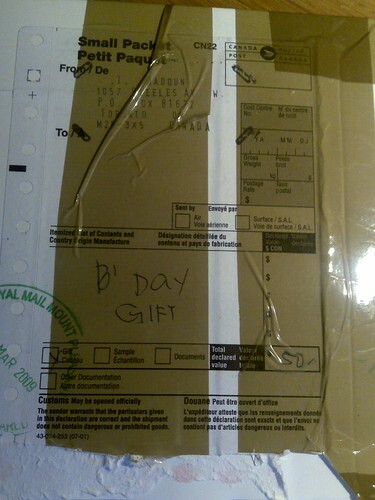 It looks like the envelope has been re-used, which suggests that the sender was the recipient of the original package, which seems to have come from Toronto, Canada, back in March 2009. Aside from that, all we know is that the mystery sender’s handwriting is a little sloppy. If it’s you that sent it: thanks! But who the hell are you?